I am reviewing Indian cooking sauces from the Spice Tailor. Do you like Indian food? Would you like to create spicy dishes with the wow factor for your family? Are you daunted and unclear on just what type of spices to use? When I make a curry, it is usually edible enough but never reflects the true sense of Indian delights. That is proably because I really don’t know what flavour combinations to use or what is the “right” quantity of curry powder or spices. I need worry no longer as TV chef and cookery writer Anjum Anand has launched her own range of cookery sauces called The Spice Tailor. I combined the fragrant and zingy mangalore herb curry version with beef. You can choose to use any red or white meat. The first thing that impressed me was that you get a little packet of spices that really look the part and get you in the mood. You heat them in oil for just 20 seconds and then add your cubed meat for 2 minutes, browning lightly. You then take the sauce which has such a rich colour, stir it in and 7 minutes later, you have your completed dish. Fast food but not as we know it. When we tasted the results, we were impressed with how balanced the flavour was. A definite kick but not too daunting and lovely with our naan breads. It looked beautiful too. The Spice Tailor products come with preparation guidelines but also lots of different ways to adapt the recipe to taste. 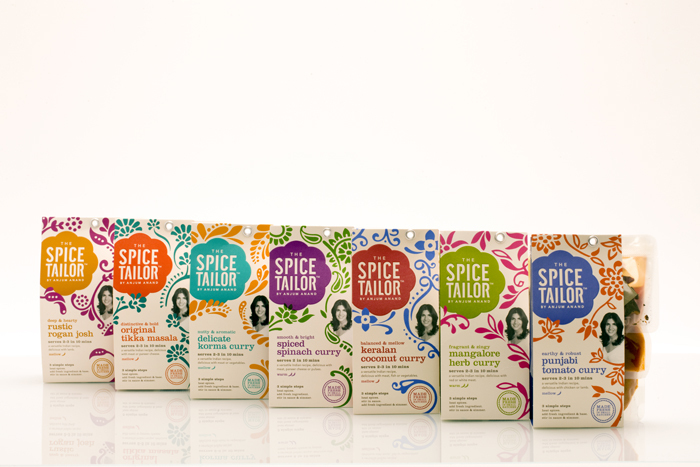 The Spice Tailor sauces are easy to use so anyone can create great tasting, authentic Indian dishes using them.